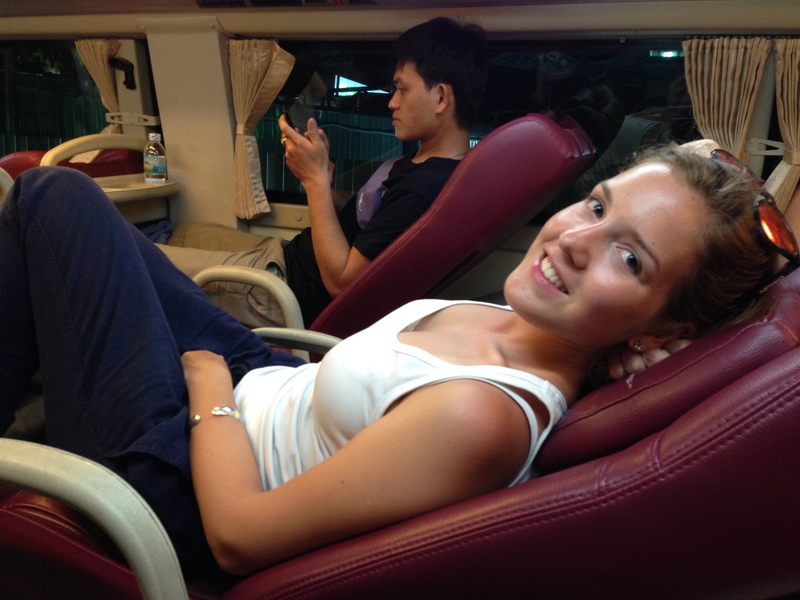 After four nights in Hoi An, we got on yet another sleeper bus, but this time for Nha Trang. Our hotel in Hoi An promised to reserve us the seats we wanted on the bus, but that was another broken promise. As soon as the coach arrived there was a scramble to get onto the bus and not end up in the back row. Luckily being the small and feisty girl that I am, I managed to get on the bus and nab us some pretty good seats. We arrived in Nha Trang at 6 am in the morning – the first time a bus has actually arrived at its scheduled arrival time, and the streets were absolutely jam packed with touts and motorbike taxis. We were literaly surrounded by a mob of people shouting and yelling at us asking where we were going, what we were doing, etc, etc. It was way too much and we managed to bundle into a cab and arrive at our hotel. We arrived like eager beavers at our hotel at 7am and they were nice enough to let us check-in. We showered, found some breakfast, booked two scuba dives for the next day, and made our way to Vinpearl amusement park all before 9am! Vinpearl had roller coasters, a water park, an aquarium, a free arcade, a beach and a dolphin show for about £15 each. The ticket included the cable car ride from the main land to the Vinpearl island – which was worth the Vinpearl entry ticket price in itself for the incredible views. Vinpearl was actually pretty lame… Some of the water slides were actually painful and I cut my elbow on one of the slides. They needed some serious maintenance! We also tried to combat my fear of heights by going on slides that were basically a vertical drop from start to finish. I very nearly chickened out, but in the end I just went down and it wasn’t too bad! I still don’t like the free fall bit… I hate the way it makes my stomach feel. I’m thinking of maybe trying bungee jumping or sky diving in Australia, but I’m just taking baby steps at this moment in time. 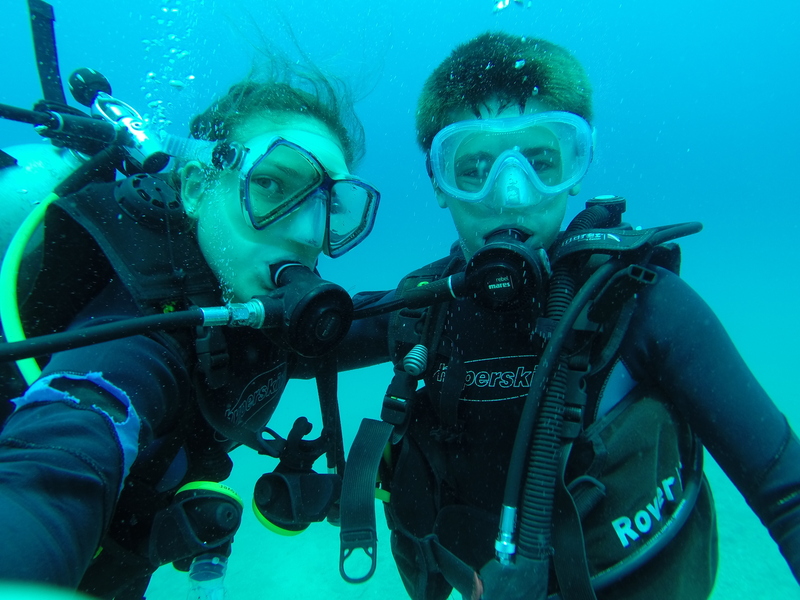 The following morning we went on two dives with Angel Dives, a French-owned dive company. 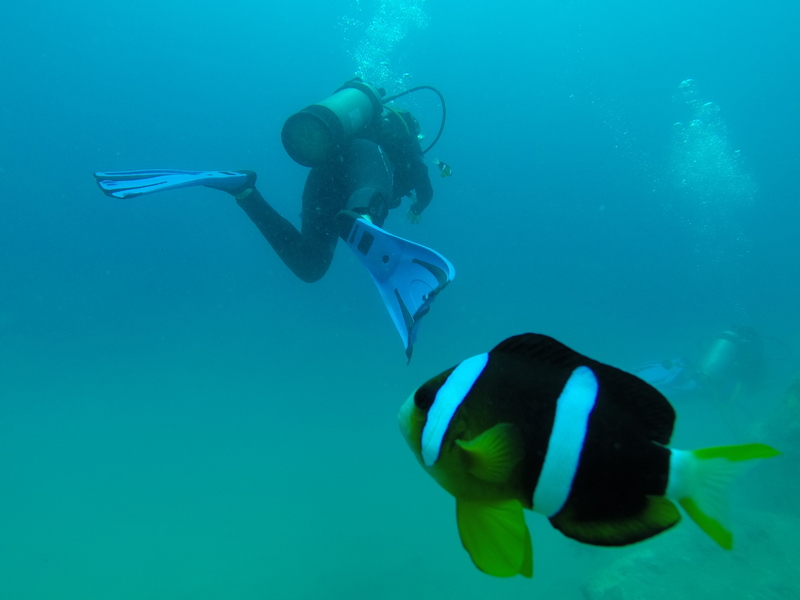 We were a little unsure about doing some dives in Vietnam as we’d heard the visibility was often poor and wouldn’t match what we’d seen in Thailand, but the visibility was actually crystal clear. 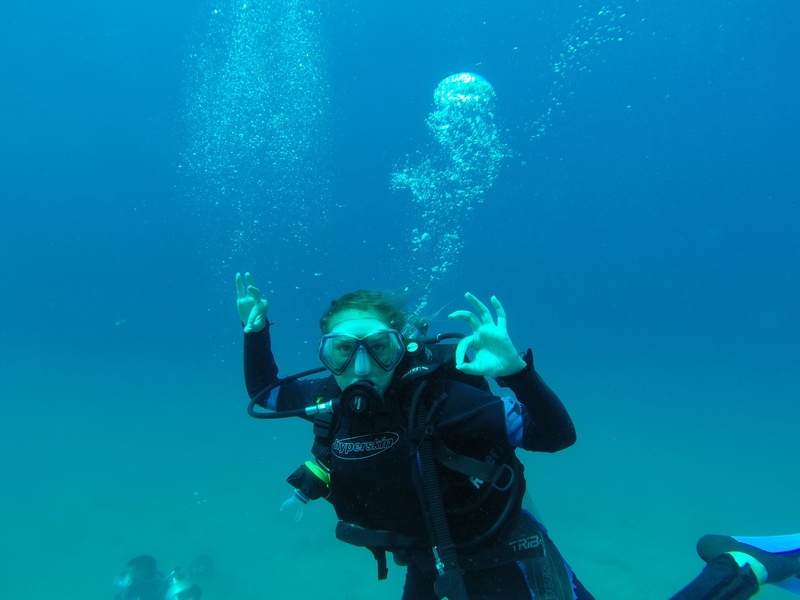 We got to see some cool coral and fish, but our dive master who was guiding and leading the dive was more interested in taking underwater pictures of the same thing again and again, so I pulled some silly poses while Kyle took pictures. After Vinpearl and our dives, we decided it was high time to leave Nha Trang as it was incredibly touristy and FULL of Russians. When all the signs for restaurants, shops and pharmacies are all written in Russian you know it’s time to leave. We’d met this British expat who’d married and was now living in Vietnam on our dive boat who explained why Nha Trang attracts so many Russians. Apparently Vinpearl is joint owned by a Vietnamese billionaire and the Russian Mafia. They have an agreement that Russians are allowed to fly direct from Russia to Nha Trang without a visa. He also told us the trials and tribulations of being a Westerner married to a Vietnamese woman and living in Ho Chi Minh City. He told us that shopping was a real problem at the beginning of their marriage. He’d go into a shop and see something he liked and the owner would try and make him pay 5x the price a Vietnamese local would pay. He started going shopping with his wife in the hope they’d charge the normal Vietnamese local price, but because she was married to a Westerner they’d charge her 3x the local price. He said his wife would even try to return to the shop a couple days but the owner always remembered that she was married to a Westerner and would charge 3x the local price. He explained how camera phones changed his life because from that moment on he’d just take a picture of what he wanted and his wife would then go and buy it for him – without getting ripped off. I asked him what he missed most about England and he said SAUSAGES – pork and apple ones. He misses them so much that he bought a sausage maker to make his own.